After a 45-day break, Gateway Fighting Series was back in action at the Lamborghini Gold Coast Athletic Center Friday in downtown St. Charles for an all-amateur event. Women's bouts were front and center with a high profile women's MMA and a K1 rematch taking the co and main events respectively. The card had plenty of action, but it was the judges who couldn't seem to agree with three split decisions on the nine-fight card. In the main event, Lillie Storey unleashed her kicks to battle back from a slow start to win the third round and take a narrow decision victory over Katelyn Jesse in a K1 rematch of a previous bout where Storey was also victorious. Jesse's range was the deciding factor early with a long jab keeping Storey off balance and out of range.on the outside. The second was the closest of the three-round fight with Storey battling back to edge out her opponent in the second and used that momentum to win the third round and unanimous decision from all three judges. In a highly anticipated women's MMA bout, hometown favorite Brittney Cloudy took on a five-time IBJJF World Champion from American Top Team, Luanna Alzuguir. The game plan was obvious from the start as the jiu-jitsu world champ wanted to get the fight to the ground early and often, while Cloudy used her footwork, and technique against the cage to try and keep the fight standing. After a brief feeling out phase, Alzuguir would get Cloudy to her back to the mat, but time ran out, and she was unable to capitalize. In the second, with her back to the cage once again, Cloudy was able to maneuver behind Alzuguir to take her back and used her strength to drag her down to the ground. Once the fighters hit the mat, Alzuguir was able to scramble on top and was able to work into half-guard for the rest of the round, looking for a kimura, and landing punches when able. The third saw another takedown from Alzuguir, but this time early in the round with plenty of time to work. With a smothering top game, Alzuguir was eventually able to take the back of Cloudy to secure a rear naked choke and score a victory. In a men's lightweight feature bout, Justin Lankford survived an early scare to cruise to a victory over Zachary Burcham. Lankford wasted little time imposing his ground game and went for the takedown right from the start. Despite successfully taking down Burcham, Lankford gave up his neck and allowed Burcham to work his guillotine. An entertaining scramble followed with Lankford attempting to wiggle free, but Burcham didn't have it. Eventually Lankford worked into side control and was able to finish the round on top. The second saw more of the same with Lankford nailing a takedown, working to the back of Burcham and finishing with a TKO. The win improves Lankford, now training at Hahn's MMA, to 11-5 in his first fight since June of 2016. Edwin Rowe, out of Watson Martial Arts, scored a big knockdown in the second taking an early lead in a K1 match-up when his overhand right connected flush to the jaw of opponent Brandon Smith. Full of confidence, Rowe went to work, chopping away at his opponent legs with powerful, thundering kicks leaving Smith worse for wear on his lead leg. Barely surviving the second, Smith showed great heart limping his way into the third, but it only took one kick from Rowe to see Smith take a knee forcing referee Tim Francis to wave off the fight. Rowe's teammate Alejandro Soccorro lost a very close decision to late replacement Steve Barbee in an exciting bantamweight K1 match-up. It was pedal to the metal early in this one as Soccorro pushed the pace with a high volume of punches. Barbee survived the first, enduring a few low blows in the process, to rally back and take the final two rounds and a split decision victory in the most exciting fight of the night. 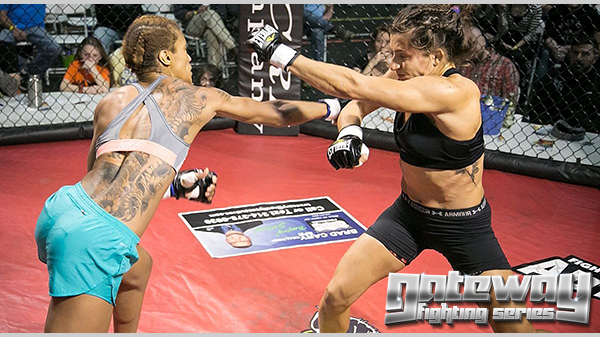 Lacie Brayton out of Hahn's dominated opponent Nadia Epps in a women's K1 bout. It was all Brayton in this one, who along with teammate Zoey Hahn promise a bright future for the team out of Arnold. Michael Nyguen narrowly edged out Danny Wildridge in a 160 pound K1 bout. Nyguen earned a razor-thin split decision victory. 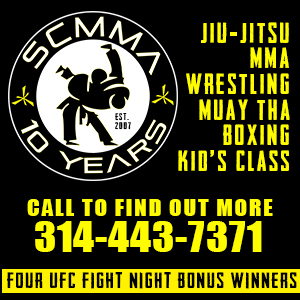 Arnold BJJ's Dakoda Schuenemeyer won his MMA debut. Schuenemeyer scored a takedown, worked to the back and finished with ground and pound to earn a TKO victory in the first round. Kicking things off on the night was Brendon Ameday and Orel Dahan. Ameday won by split decision. Gateway Fighting Series is back in November for an amateur boxing event.